I've never tried to make a vintage style card before so I was really up for the challenge Ann Melvin set us in her Stampin' Up! group this week. All we had to do was use whatever we wanted to use to create a vintage style project. That was it. Well I thought about it and decided I would have to find something to CASE as I had no idea how to create a vintage look all by myself. Then I got to thinking as I was tidying up some scraps and retired papers and thought that I did know what vintage kind of looked like. I belong to a number of crafting groups and have seen vintage or shabby cards and so I thought perhaps I could have a go without a CASE. 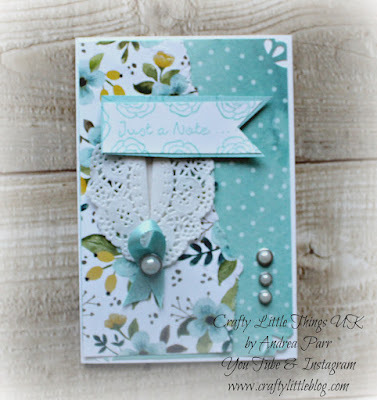 I thought about polka dots and florals, doilies and ribbon, lace and pearls and gathered up some retired and current Stampin' Up! stash and before I knew it I had created something that I felt would pass. Definitely as a first ever attempt. I owe my torn paper addition to the lovely Fiona Whitehead who I've seen use that before to create a fab vintage feel. I did feel there was something missing and when Fiona saw my finished card she suggested some ink sponging around the edges would have been a good finishing touch. Of course she was absolutely correct it really would have just given it that extra something that I felt was missing.